Whether your UTV or ATV is bone stock or loaded with accessory racks and guards, the new RAM-B-231Z-2U strap base lets you choose the best possible mounting location for almost anything. Designed for a clean installation, this base accommodates most common tubing sizes on UTV’s and ATV's, allowing for the placement of the RAM rubber ball base. Safely concealing a strap clamp in a compact housing, you won’t have to worry about exposed sharp edges or unwanted loosening. With the ball base in place, you have the foundation for mounting everything from GPS, Cell Phones, Radios, or maybe the famous RAM self-leveling drink cup holder. No matter what you choose to do with it, you’ll wonder why your UTV or ATV didn’t come from the factory with this must-have product. 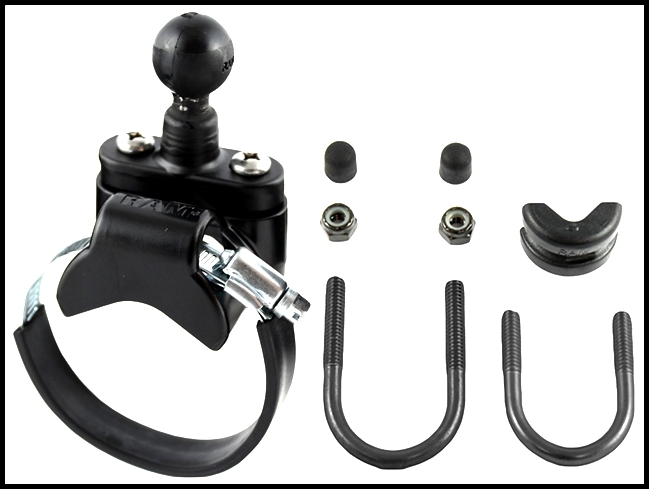 Included in the kit is a zinc coated metal u-bolt, this allowing you to modify the mount to accommodate mounting location. The base also includes black cover caps to be placed over the exposed ends of the u-bolt.